“I get what they’re trying to achieve,” he said, “but I think that the government wants to see how far they can go; I think they’re waiting for the reaction,” he said in a telephone interview on Thursday. He also said the move was unlikely to solve the problem — and could even make things worse. The authorities on Wednesday also unveiled related measures to manage tourism, all of which will apply from Jan. 1. They included cutting the maximum number of participants in guided tours of the city to 15 per group, instead of 20; making official accreditation a prerequisite for guides; and introducing an additional tax on tour participants. 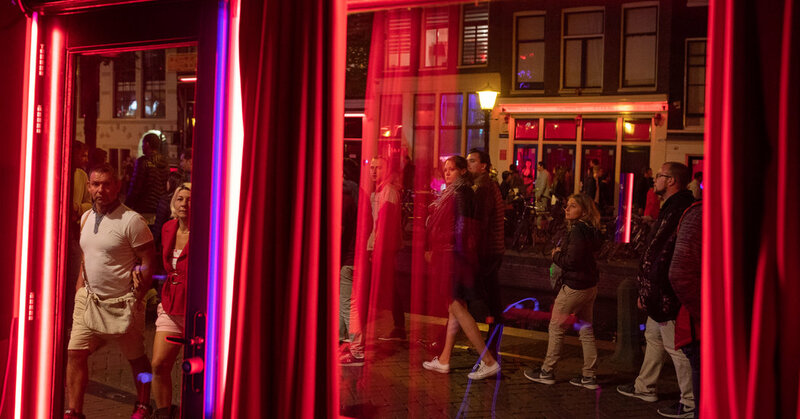 Before the ban begins, the city will start to curb tours in the red-light district: Starting on April 1, they will not be allowed to take place after 7 p.m. (they are currently allowed until 11 p.m.). The steps follow several others that the Amsterdam authorities have taken to try and regulate overeager, and often inebriated, tourists. Last year, the administration of Femke Halsema, Amsterdam’s mayor, announced a set of such measures, which included rigorous street cleaning; on-the-spot collection of fines up to 140 euros, or about $160, for public urination, drunkenness or excessive noise; and a marketing campaign to persuade visitors to respect the city and its rules. Mascha ten Bruggencate, a city administrator who had been tasked with carrying out the policies, said last fall that there was an obvious place to start. “The red-light district is symbolic of the problem,” she told The Times.